Tacky Jacks Gulf Shores is located in the Gulf Shores Waterway District, nestled among beautiful huge live Oaks and directly on the Intracoastal Waterway. It is a peaceful location to enjoy Breakfast, Lunch and Dinner 7 days a week. Come by Land or Sea and enjoy the Casual Island Atmosphere. Named one of the best Seafood Dives in the Southeast by Coastal Living Mag. 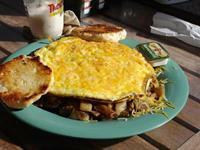 Our Famous Farmers Omelet is one of the ''100 Dishes to eat in Alabama before you die.'' Tacky Jacks is the People's Choice Award winner for Friendliest Staff, Local's Favorite Hangout, Best View on the Island, Best Island Atmosphere and Best Happy Hour. We offer a menu that is sure to please, including Seafood dishes, Po Boys, Wraps, Sandwiches, Burgers, a wide range of Salads, Chicken and Steaks. Our Mexican Garbage is the ultimate in Nachos, large enough to share with your friends. 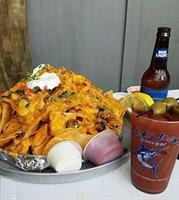 Children will enjoy our ''little vittles'' and the adults might want to try a Tacky Jacks Famous Bushwackers, absolutely the best anywhere on the island. Live music, seasonally, Thursday thru Sunday. Open Mic night every Wednesday. Summer of Fun lunchtime activities for the young and young at heart. Good food, Good Music, Good Times. Adult fun but always family friendly! From Gulf Shores Pkwy (59) turn east on 22nd Ave, just before the bridge. Turn left onto E.22nd Street (Hwy 180). Tacky Jacks is on 24th Ave & the Intracoastal Waterway just before the big curve.